Disclosure: This post has been sponsored by Libby’s. All opinions are mine alone and have not be swayed by outside sources. If I had even a dime for every time I heard those words this summer, I’d be living the good life! And it’s only been a couple of weeks. My kids, and their friends who are over my house most days, are consistently asking for something to eat. I like to blame it on boredom, but they are seldom bored. Perhaps they are all going through growth spurts this summer, I don’t know, but I need to stock up on some healthy snacks and satisfying meals to curb their appetites. Or I may go insane! Thankfully my girls love fruit! While they also love cookies and candy, they aren’t known for turning down fruit to often. That being said, with them snacking as often as they do in the summertime, fresh fruit can get costly over time. That’s where Libby’s® Fruits come in. Libby’s® Fruits are a great ingredient in your favorite recipes or served on their own as a delicious snack. There are tons of ideas on how to incorporate fruit into recipes on the Libby’s® Fruits & Vegetables website. These recipes will help to keep nutritional value high and grocery costs manageable, which is a huge perk for all of us. I love adding fruit cocktail to jello and frozen popsicles. The peach slices are great on top of vanilla ice cream and cool whip! What my kids don’t realize is by adding the peaches, I can put less ice cream in the bowl yet it looks like a large serving. I replace half the ice cream with fruit. 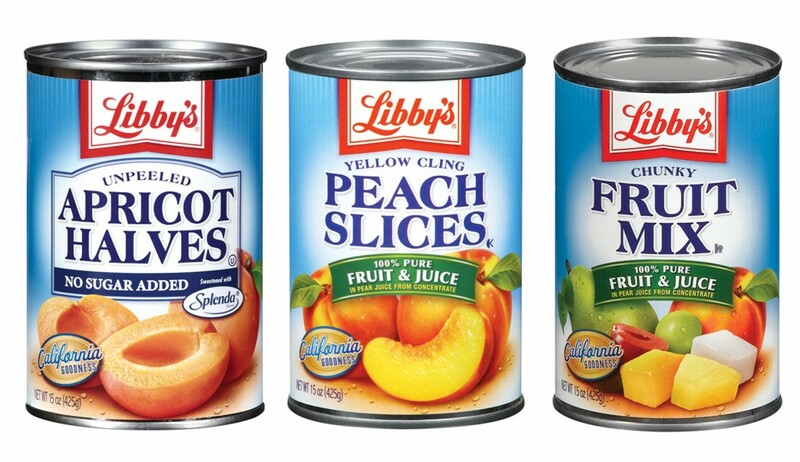 I like to combine fresh fruit with Libby’s® canned fruit when making a fruit salad to help stretch my dollars! No one has ever complained about it, they’ve only gobbled it up. I love to make peach muffins with canned peaches. This summer, try something different with a can of Libby’s® Fruits and let me know what you make! 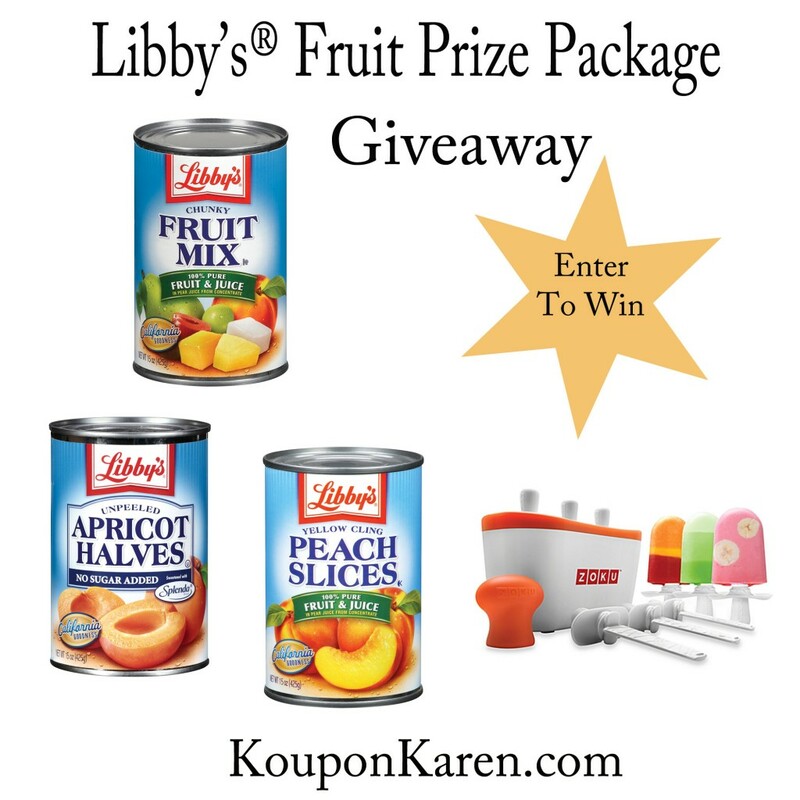 One Koupon Karen reader will win a Libby’s® prize pack which includes a Zoku® Quick Pop™ Maker and an assortment of Libby’s® fruit! To enter the giveaway, use the Giveaway Tools widget below. Email and feed subscribers will need to click-through to the site to enter the giveaway. As a reminder, comments left on Facebook or Twitter will not be included. You must follow the instructions on the widget about the proper way to enter. Of course Facebook is in no way associated with this giveaway! If you are looking for more giveaways, be sure to follow my Fun Giveaways Pinterest board! For me and my family. I like to have fruit & whipped cream for dinner. I would love to use this with my kids! I’d love to win this for my daughter. It’s perfect for the summer as it’s so hot out. Thanks.